Mini-Meatloaves & Cauliflower Mashed Potatoes | Blog, Jane! Blog! See Jane. See Jane Blog. Blog, Jane! Blog!! So I move on with my food intolerances – I’ve now cut out soy. seriously. not easy. But I am feeling better! The potatoes and cauliflower is just something I came up with based on recipes I’ve read. My kids and husband had no idea I snuck in an extra vegetable and I didn’t feel guilty serving this with “just” corn. Win-Win! Everyone clears their plate when this is served. In a medium skillet over medium-high heat, sauté onions and garlic until soft. About 5 minutes. Meanwhile, in a large bowl, add beef, and remaining meat ingredients. Add cooked onions/garlic. Carefully (onions will be hot) stir and combine meat mixture until all ingredients are incorporated. Spray muffin pans with nonstick spray. Fill muffin pans, just to the tops, with the meat mixture. Press down slightly to level tops. In a small bowl, combine sauce ingredients. Place a small spoonful of sauce on top of each mini meatloaf. With the back of the spoon, spread the sauce evenly over each loaf. 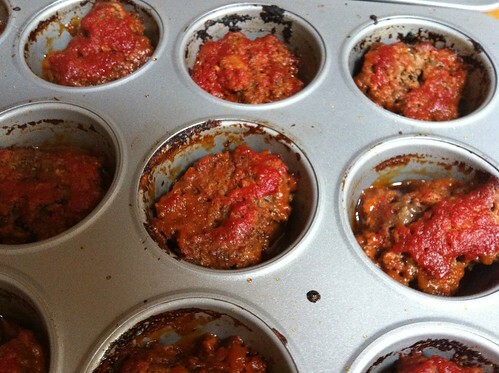 Fill any empty muffin cups halfway with water so meat bakes evenly. Bake in 375 degree oven for about 30 minutes, rotating trays halfway through. Meat should be cooked through and top edges just turning brown. Peel and cut potatoes into 1″ pieces. Add potatoes to pot. Cover with chicken broth. Bring to a boil and simmer for 10 minutes. Add cauliflower and simmer for another 10-12 minutes. Add sea salt and garlic powder to taste. *I have added heavy cream and butter back into my diet. My nutritionist pointed out that my intolerance is to dairy protein and both cream and butter are just fat. 🙂 But she did recommend using only organic and grass-fed.